Do fuss about this one. Islands of Wakfu, a two-player action adventure exclusive to Xbox Live Arcade, was finally finished on Friday by French developer Ankama. "We will announce the date of the release as soon as it is confirmed," an Ankama spokesperson told Eurogamer. "It should be done this week." 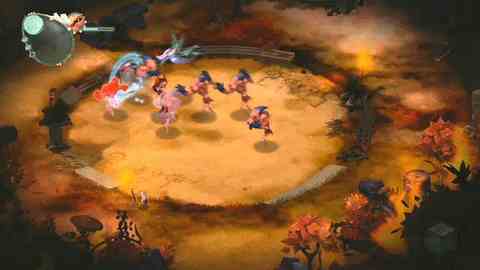 In the isometric, anime world of Islands of Wakfu, you are either a melee-attack girl or a projectile-attack dragon - or both, switching at will. A friend can join you for local co-op. The game ties into Ankama's Dofus/Wakfu family of games. Dofus, a Flash-based free-to-play MMO, has 30 million players and 3.5 million subscribers. It's a big deal. It has many leather-bound books. Wakfu, published by Square Enix, will be the sequel to Dofus. The two can coexist. Dofus Arena, Slage and Islands of Wakfu are all spin-offs. Eurogamer's Oli Welsh jetted off to France last year to meet the whole Ankama family. Of Islands of Wakfu he wrote: "With open progression across multiple quests, lots of collection, stunning presentation and beguiling music, Islands of Wakfu has enough charm to carry the apparent simplicity of the action - but knowing Ankama, there could easily be more here than meets the eye."